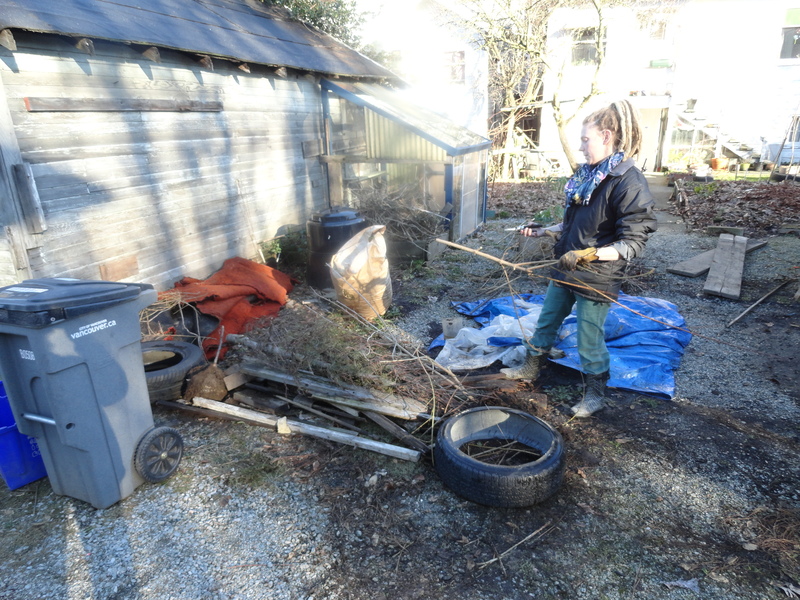 Hugelkultur…as in raised garden beds built, mound-like, of bramble and soil. 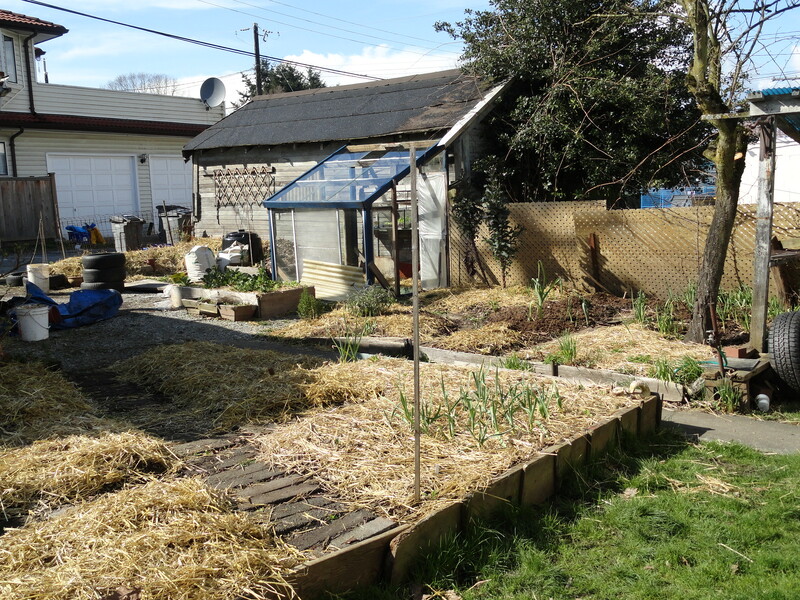 I’m expanding the garden once again with the addition of a hugelkultur raised bed on the rear of our property. The project was inspired by and decided upon within an hour of finishing reading Sepp Holzer’s Permaculture, in which Holzer describes a method for establishing new and long-lasting garden beds by simply piling up raw materials and covering them over with soil. Hugel is German for hill, or mound. The inner-most ingredient in a Hugel bed is wood–branches and trimmings from the yard, old lumber if it isn’t treated or painted with lead, even entire fallen trees for a really long bed. By design, the wood, as it decomposes in the center of the mound, should become like a sponge and hold a resevoir of water which plant roots can tap into and feed from. The largest wood goes in the center, followed by smaller branches and brambles. I didn’t happen to have any fallen trees at hand, just a sad Christmas tree the city kept missing on collection day and a fifty-year-old carpet that had sat outside in the rain for a year, molding and falling apart. Into the Hugel bed they went. 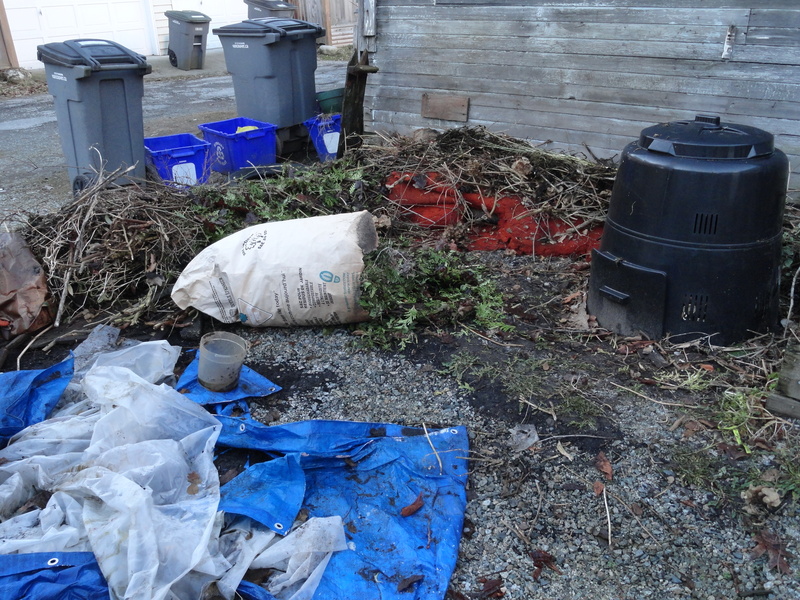 Carpet and rotting wood form the foundation of the Hugelkultur garden addition. The middle layer of the bed can be made of whatever organic materials are on hand… anything biodegradable, really. 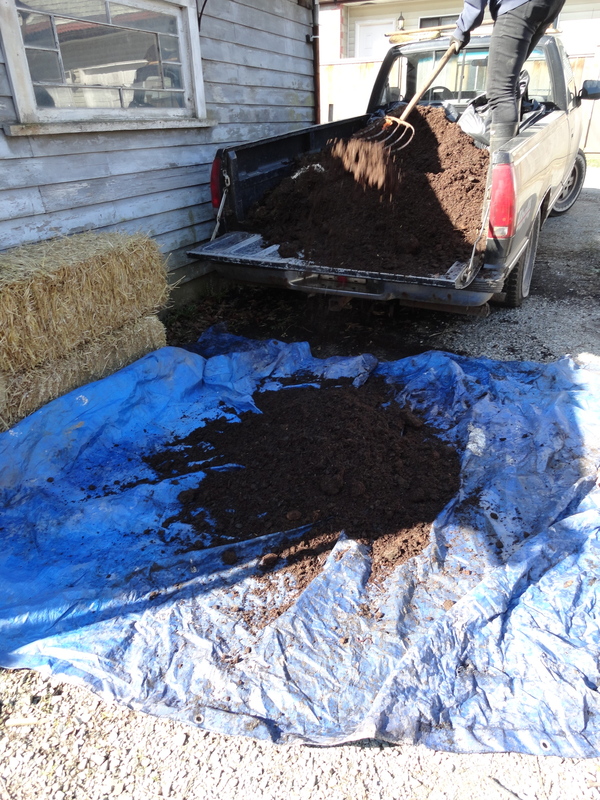 I would put coarser materials on first, like straw and leaves; then finer, nutritive materials like manure and/or compost. The latter will provide immediate fertility to initial plantings, while the longer break-down time of the former will ensure continued fertility and soil tilth. 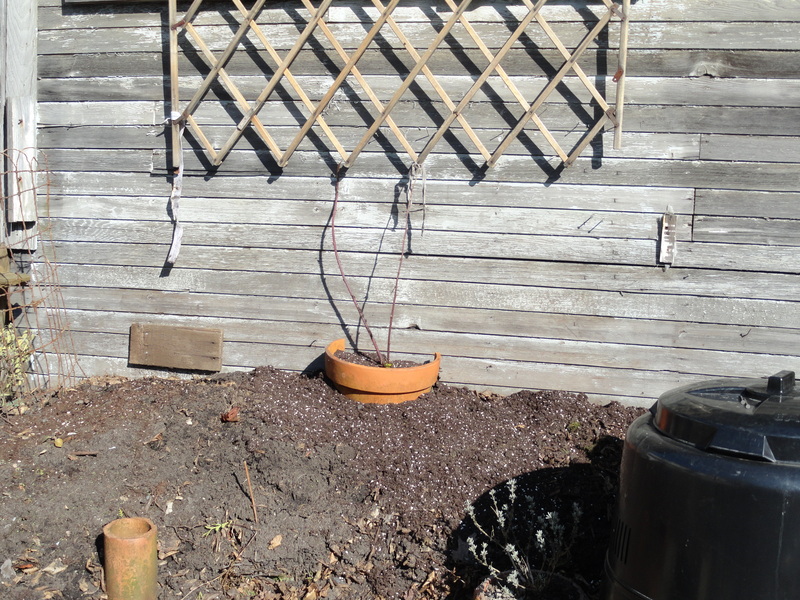 Finally–and I’m not even to this step yet–the bed should be covered with topsoil and planted into immediately. As plants get established and start growing, sending down their roots, the layers of the bed will be woven together so that the whole thing holds. Mulching between plants will also help retain soil and water. Alternately, you could sow the whole bed with a “green manure” cover crop like clover, vetch, or lupins which would hold the soil in place and fix nitrogen in preparation for planting a heavy-feeding crop like corn on the new hugel bed. 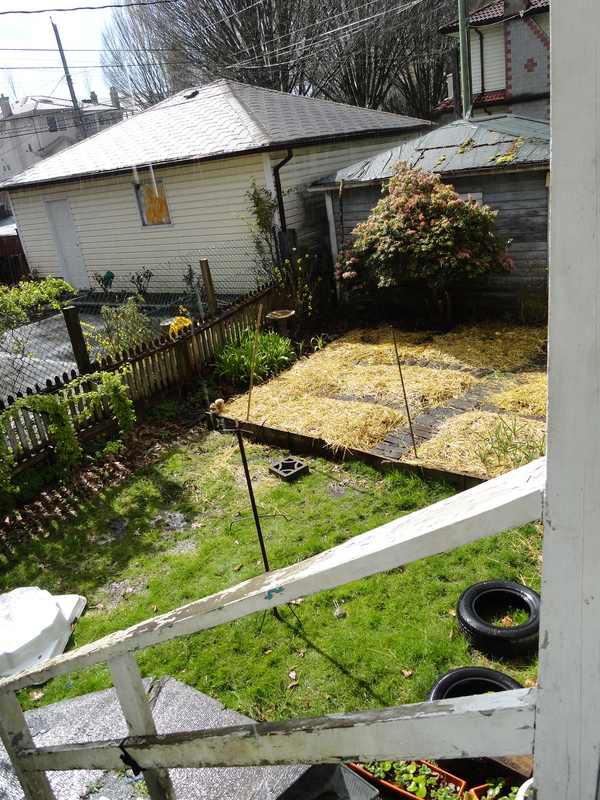 I think my new Holzer-inspired hugel bed will be planted with clover and lupins initially and, later, with sunflowers, peas, beans, squash, some heat-loving herbs, and the tayberry (which will be trained against the wall of the neighbor’s garage). When completed, my hugel bed won’t be nearly as high as Holzer makes his, but with the addition of a trellis along its ridge for the vining plants to grow up, I think it will do double duty as a privacy screen blocking the view from the lane behind our property. I’ll post more pics as it comes together over the next few weekends. Firstly, there’s still no news about the potential move to Switzerland and with the economy what it is right now, we’re assuming that “No news is bad news” and resisting the urge to feel anything about it right now. Insecurity and uncertainty about the future seems to be the new norm and so we figure we’re in the same boat, but still doing better than all the millions of people losing their jobs and their homes. Vancouver, I think, has remained somewhat isolated from the major economic downturn–perhaps due to affluence, next year’s winter Olympics… I’m not really sure, but I’m perfectly happy to stay right here in Vancouver where I have my friends, my community, my garden…my life. We missed most of the major snow storm that hit mid-winter, but spring is shaping up to be absolutely beautiful. I saw the most intense rainbow of my life just last week. We’ve had lots of rain to bring the flowers up and lots of sun, too. Unfortunately, it seems the sun is always out on Saturdays when I’m in my yoga teacher training program all day and it always clouds over just in time for Sunday, or Family “Fun” Day as we’ve taken to calling it (although three-year-old Eleanor has taken to turning it into come-between-the-parents-andplay-one-off-the-other day). Yes, Eleanor is three and–what do you know?–the Sunday that we had her birthday party was the only sunny Sunday in recent weeks! At least we can be thankful for that. We had seven kids an their parents over so it was really nice to be able to spread out and use the patio for part of the party. See our flickr stream (www.flickr.com/photos/twistycorn) for an idea of how messy it was! The streamers hung from the ceiling for over two weeks! Eleanor got lots of cool stuff, but her big gift was her brand new blue bicycle, which she rides everywhere now. Next weekend, we’re taking her to see Annie at the Vancouver Centre for Performing Arts. We considered making the tickets her birthday present, but thought three weeks was too long to make a three-year-old wait. In other news, Eleanor and I, on one exceptionally beautiful spring-like day, decided to plant part of ur garden experimentally early. 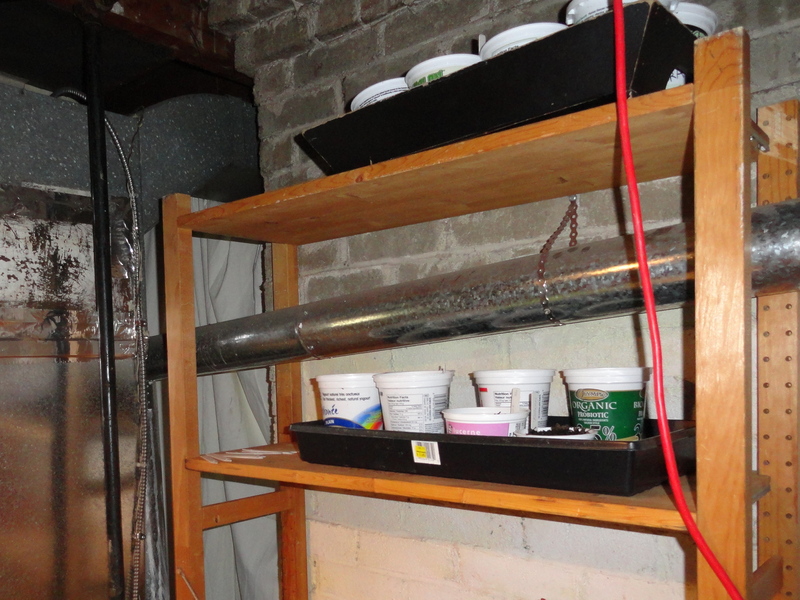 I’ve also got some peppers and tomatoes started indoors to get a headstart on their growing season. I saved (also experimentally, since I wasn’t sure if the whole fermenting, separating, drying process was going to work for me on my first try) seeds from some especially delicious tomatoes I purchased at the local farmer’s markt last summer. For all those out there who have never really liked tomatoes, look for one called the German Red Strawberry Tomato. I swear, it’s the best! It’s everything I ever wanted a tomato to be, and more! Also, my German Rams (Ramirezi Cichlids) have finally produced a batch of eggs that they didn’t eat within a day and now the little fry are wiggling around wanting to grow and swim! How exciting to watch the miracle of life unfold before my eyes!